The amateur newspaper occupies an unusual place in the history of journalism. An amateur journal is a periodical created to afford pleasure to its readers as well as to its editor and its publisher. The rage to publish, rather than profit, is the motive that most often induces people to become amateur journalists; and, throughout the history of the genre, most but not all amateur journalists have been juveniles. The amateur newspaper collection at the American Antiquarian Society consists of tens of thousands of issues. There are more than 3,900 titles, from every state except Alaska and Hawaii. The Society has files of seventy-seven titles from Worcester alone. Amateur newspapers range in size from miniature to quarto, and from two to as many as fifty or more pages. The Society concentrates its efforts on acquiring amateur papers that were published in the United States from the time of their first appearance until the year 1900. It is not known for certain when amateur journalism began, but the first amateur newspaper published in the United States is believed to be the Thespian Mirror. This paper was edited by John Howard Payne, the future dramatist and actor, while he was a New York City bookkeeper. The first issue appeared on December 28, 1805, and the final issue on May 31, 1806. The journal was printed for Payne, then just fourteen years old, by professional printers and was intended for an adult audience. AAS owns seven of the fourteen issues of this amateur paper that included theatrical reviews, biographical sketches, and poetry. Pen-printed amateur newspapers were also made by amateur journalists. The Society holds the earliest extant issue of a pen-printed amateur newspaper by James Johns of Huntington, Vermont, dated October 10, 1834. During the 1840s and 1850s, amateur newspapers began to proliferate. 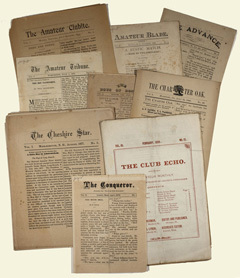 Until the late 1860s there were three methods of publication available to the amateur journalists: (1) writing or printing the contents of the paper with pen or pencil, the method used by the editors of the Flower, published at Smithfield, Rhode Island, in 1836, and for the Casket, published at Boylston, Massachusetts, in 1857; (2) paying a professional printer to do the typesetting and presswork with the aid of the amateur's manuscript, as did John Howard Payne; and (3) building his or her own press, as did Marcus Rogers, who in 1854 constructed a press and printed the Rising Sun at Mill River, Massachusetts, and Cyrus Curtis, who in 1865 utilized a discarded hand press to print the Young American at Portland, Maine. In 1867, Benjamin O. Woods of Boston invented an inexpensive "Novelty Press" (as Woods named it), which, owing to its simple construction, could be sold for a few dollars. Woods advertised his press in periodicals designed for youngsters, which also carried news about amateur printers and editors. During the ten years following the invention of Wood's press, the number of amateur newspapers in existence increased from fewer than 100 to almost 1,000. Although many of these were short-lived, some endured for five years or more. Amateur journalism flourished all across the country from Maine to California. In addition to editorials, original short fiction, essays, jokes, stories gleaned from other publications (both amateur and professional), and poetry, puzzle departments began to appear as a regular feature in many amateur papers. The Society has a great many amateur journals from the 1870s and 1880s, the golden age of amateurdom. The collection is partially cataloged in the General Catalog. The collection is digitally available in Gale's Amateur Newspapers from the American Antiquarian Society. This resource is available onsite at AAS and via subscription from Gale. An inventory for the collection is available as a pdf. An inventory for the amateur newspapers in the manuscript collection is available.